Baldwin County Fire Rescue, the Milledgeville Fire Department, Baldwin County Sheriff’s Office, Milledgeville Police Department and the Georgia State Patrol joined together Thursday to honor and remember the anniversary of the Sept. 11, 2001 terrorist attacks in conjunction with Cry out for America. 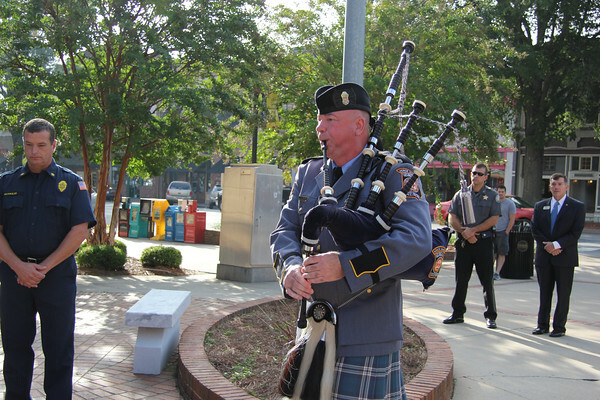 Military and public safety personnel were cited for their continuing service to communities and their country in front of the Baldwin County Courthouse Peace Monument. County Commissioner Sammy Hall said this is a day we should never forget. Hall urges a large crowd to remember those who have fallen and public safety agencies that continue to support us. ‘They always step forward in a crisis,’ Hall said. New Milledgeville resident Edwin Atkins was living in Manhattan during 9/11. He went to the site to help and said Georgia was well represented in the aftermath. Folks then walked to the old Baldwin County Courthouse led by the Georgia State Patrol Honor Guard, where the ceremony concluded by praying for our country and those servicemen and women who watch over everyone.